Even though Russia has advanced south into Georgia, a best-selling new Bible prophecy book says suggestions this signals an imminent march into the Middle East are mistaken. Instead, says Bill Salus, author of “Isralestine,” the world is about to be surprised by a different kind of devastating regional war involving Israel and its Arab neighbors. Psalm 83 is a prayer by Asaph for God to destroy Israel’s enemies, who are plotting together. The New Jerusalem Bible notes that the Psalm “enumerates ten traditional enemies of Israel whose hostility was maintained to a late date, see 2 Ch 20:1seq; Ne 2:19; 1 M 5:3seq”. However, while Biblical scholars see the “late date” as some time during the Biblical period, Salus, like many other Anglo-American Biblical literalists over the past few hundred years, reads such passages as prophecies referring to our near future. …As per Psalm 83, destinys [sic] design for this great army is a head to head confrontation with a formidable Arab confederacy consisting of Palestinians, Lebanese, Syrians, Jordanians, Saudi Arabians and Egyptians. This Arab coalition has been developing in its fledgling stages since 1948 and will climax and officially confederate in the very near future. The Israeli Defense Force will decisively defeat this offensive and prove to be the exceedingly great army of Ezekiel 3710. They will expand their territory, become regionally superior, take prisoners of war and exploit the resources of these conquered Arab nations. In that condition they will become one of, if not the wealthiest nations on earth. It is from that position of empowerment that the Jews will dwell securely in the Middle East. Subsequently the world stage is set for the Russian Iranian led coalition of nations, which will form against Israel as prophesied in the book of Ezekiel, chapters 38 and 39. This nonfiction thriller is carefully designed to cautiously navigate the reader through the end times calendar. Fruchtenbaum is a Messianic Jewish speaker and writer; like Hal Lindsey, he is a graduate of the Dallas Theological Seminary. Salus had the good idea of putting a website address on the cover; alas, however, it has a “.net” suffix when it should be “.org”. The actual website is here. It carries several endorsements: as well as Fruchtenbaum, support comes from David Reagan of Lamb & Lion Ministries, Tom Horn of RaidersNewsNetwork, Terry James of Rapture Ready and – curiously – from Penny Usherwood, Post Grad Professor in Middle East History and Current Events at Cal State University (“Thanks to unprecedented research by eschatology expert Bill Salus, and an amazing prophecy that has been hidden from most until now, the world is in for a surprise that could effect every man, woman and child. Groundbreaking!”). The Hebrew prophets Jeremiah and Zephaniah declared approximately 2600 years ago, that their God Jehovah would someday destroy “all the gods of the earth”. Perched atop a lofty god-list inclusive of Satan, Shiva, Vishnu, and hundreds of other imposters, sits Allah. Part two of this three-part study explores the two primary prophetic episodes that extinguish Allah, and expire Islam. In essence we will discover how Allah surrenders his Akbar (i.e.- greatness)…Prior to issuing this decree against the false gods, Zephaniah 2:4-10 describes the I.D.F. takeover of the Gaza Strip and the West Bank, as well as parts of Northern and Central Jordan. 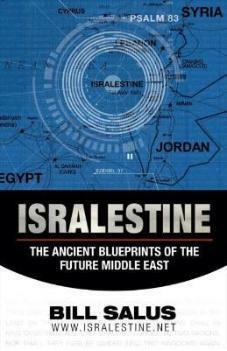 As my book Isralestine, The Ancient Blueprints of the Future Middle East points out, additional Arab soil is annexed by the I.D.F. at this time. Amazon says the book is published by “HighWay”, but in fact it comes to us through Tom Horn’s Anomalos Publishers. Anomalos’s other authors include Hilmar von Campe, whom I introduced here. There appears to be some confusion over how to spell Salus’s name: the book calls him “Bill Salus”, but in some places – such as this RaidersNewsNetwork article – he is “Bill Salhus”. This is the same Bill Salhus who works as a mortgage broker with a firm which offers 40-year mortgages, so presumably we don’t need to worry about the end of the world until at least 2048. Appropriately, Amazon has a special offer if you buy the book with The Temple At The Center Of Time.